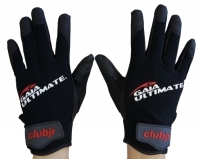 These new GAIA Ultimate gloves are also imported from Japan - the mother country of playing Ultimate with gloves in all weather conditions and all year-round. New and even grippier fabric on the inside, exclusively used for GAIA Ultimate Gloves. The grippy fabric is now on 3 sides of all fingers (not only on the inside) to give more grip on the disc, especially for the flick. New 4-way stretch fabric on the outside (back of hand and fingers) provides perfect hand and finger movement. Slightly longer cut on the palm for better fit on the heel of hand and the wrist. Hook-and-loop fastener for better adjustment and easier on and off. They fit tight but are still very comfortable and have thin rubber parts wherever you need the grip to the disc. Most men wear size XL, most women use size S or M.
Please note that gloves may split or brake off if you wear them too tight. 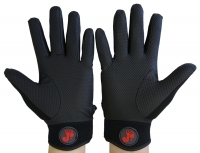 The gloves are machine washable, hang to dry - do NOT use a dryer! This Product was added to our catalogue on Thursday, 10. November 2016.